Successfully Added Mini Bluetooth QWERTY Keyboard - OS Optimized, Touch Mouse Pad to your Shopping Cart. 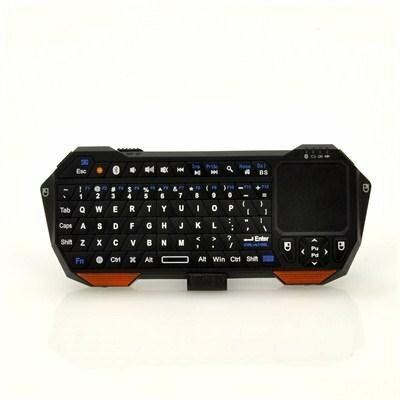 Mini Bluetooth QWERTY Keyboard customized to work best individually with Windows, iOS, or Android, and with a mouse touchpad giving you a great way to enhance your computer and mobile phone experience. Most Bluetooth keyboards basically connect to a OS and work. However this new mini Bluetooth keyboard accessory, each time you connect with Bluetooth and use the function key 'FN' and the required letter, the keyboard optimizes itself to the OS selected (iOS, android, or Windows). With responsive and writing capabilities, this ultra portable Bluetooth keyboard offers you wireless functionality for your device wherever you are. With its portable and compact design, this QWERTY keyboard comfortably fits in your pocket or in your hand. And with a full QWERTY keyboard setup, multiple function keys, analog stick mouse control and more, use with any device is both easy and fun. On the right hand side of the keyboard is an easy to use touchpad that moves the cursor just like how a mouse works on a PC. Use this keyboard as an all in one remote control, text input, game pad, and media controller. Also accompanying this wireless keyboard is a USB cable that connects directly into your computer and lets you charge and use your keyboard at the same time if the keyboard’s built-in battery starts needs charging up. 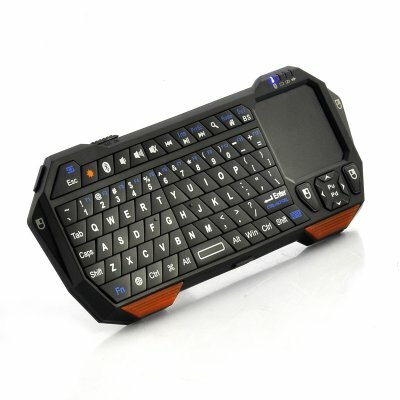 This mini Bluetooth QWERTY keyboard is compact and compatible with most modern systems. This product is in stock and can be dispatched within 24 hours of ordering with a 12 month warranty. Brought to you by the leaders in wholesale electronics and cell phone watches, Chinavasion. "iOS", "Android", and "Windows" are trademarks of Apple Inc., Microsoft Inc, and Google, registered in the U.S. and other countries. This is not claimed to be an authorized or branded product by these companies although it is compatible. This product and our company are not affiliated with these companies or endorsed by them in any way. If your PC doesn't have Bluetooth then you will need a Bluetooth dongle to work with this keyboard. Bluetooth dongle is not included in this package and need to be bought separately. To keyboard can be switched between different operating systems by pressing the function button and a letter: iOS System = FN+Q button, Windows System = FN+W button, Android System = FN+E button. muy buen producto por precio. Solidly built. Sensible button placement. Backlit. Has separate modes for OS X, Windows, and Android. Lightweight. Long-lasting battery. Grippy rubber thumb pads. Charges with a standard(!) micro-USB port. Good tactility in the keys. Manual claims the blindingly bright Bluetooth LED is supposed to be "off after paired", but I have not found this to be the case. I'll probably have to place a semi-translucent film on top of it.